Home >Amazon Shoppers>Amazon Shoppers guides>How to get more coupon requests approvals? 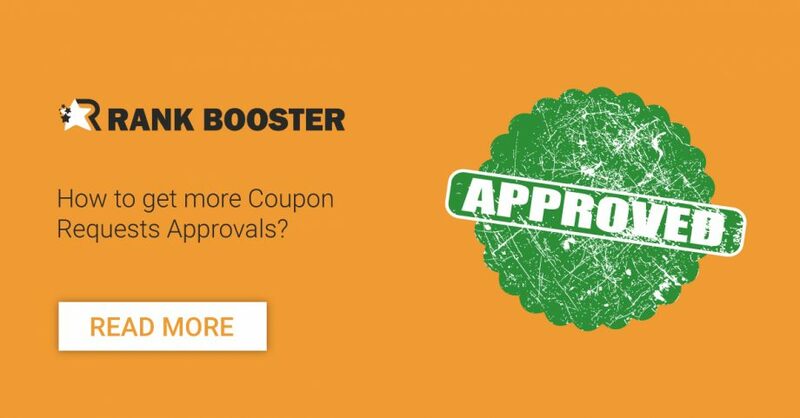 How to get more coupon requests approvals? What is Rank-Booster all about? We started as a small facebook group – AMZ REVIEW STARS, that connected Amazon sellers with reviewers. After the new T.O.S of Amazon regarding reviews, we found another way to help Amazon Sellers to promote their products on Amazon In exchange for a discount coupon code. Here is how you get into the picture. You will be exposed to promotions between 30% off to 100% off, and you will have the option to ask for a coupon in exchange for your review on social media. Shopper will be chosen based on their Social media Platforms and not based on their Amazon profile Rank. HOW CAN YOU GET MORE APPROVALS? Since July 12, 2017, Rank Booster calculating Internal Ranking for Rank Booster Reviewers. The #Ranking based on many things, starting from the amount of coupon requests approvals, Order IDs and reports, Social media Shares, Reviews and Shares from Blog-Booster.com and so on. You can find more details here. Verify your phone number and get your VP sign. The VP sign shows the seller you are a real person with a phone number from your country. VP shoppers get at least x3 more approvals. There are more than 25,000 Shoppers on rank-booster.com, We post the deals on our Facebook Groups and the best promotions will be sent on a daily email and desktop/mobile notifications. Join our Facebook groups and follow the Latest Promotions Page. You can also subscribe to our Desktop/Mobile notifications by clicking the red bell on the left bottom corner. After you login to rank-booster.com, Choose EDIT PROFILE and add your social media platforms links. Shoppers will be chosen based on their Social media platforms and not based on their Amazon ranking. How long are you reviewing? What kind of products would you like to review? Maybe your wish will come true… Adding a product to wishlist help the seller a lot, it will help the seller to boost his rank on Amazon, which is the reason why rank booster established. Once the seller checks your profile, let him see your latest reviews. It will help him to understand which kind of reviews you made, what is the quality and see how many reactions you have on your reviews. You can find examples using the hashtag #RankBoosterReview. Statistically, the highest approvals amount goes to Video reviewers. YouTube Channel will increase your approvals Dramatically. Video review of 1-5 minutes is highly appreciated by the sellers and by Rank-Booster. Sellers can search shoppers based on their social media platforms and the internal ranking. once a seller sends you a coupon you can choose to accept or decline the offer. as much as you be higher in the results you will get more coupons from sellers. Hi I have been reviewing for over 5 years , I love it , I love doing unboxing videos and show how the product works, I share it on my Facebook page and hi dollar items if I get at a reasonable price I even pay to boost the reh review ! I hope to get the opportunity to review your item , thank you . I am brand new too this, however, I have been reviewing products for years but without anything in return. I always leave reviews every chance I get so I am finding this both fun and exciting. I can’t wait to jump into this with both feet!!! Thank you for this opportunity! I am new here and I love unboxing, taking videos and using the product myself. I have 1500 facebook friends and 500+ instagram followers. Hi! I am new to this but I have been reviewing for 2 years now . I like taking pictures and videos and share it on my social media with words on how products works and the quality. I find this interesting and exciting. I hope I’ll bhabr an opportunity to review your item. Hi i am new to this site and im ready to start making videos and selling products that i believe are awesome! I have social media and about 2000 fb friends and followers also have instagram ! Hi..I’m new to all this..only have been reviewing for very short time but I’m very excited..my friends and I have got a couple pages for posting awsome discounts on..
Hello! I have been reviewing a lot of different products on several sites. I would love to do reviews for you as well if given the opportunity. Thank you for considering me to review products.